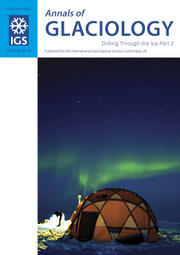 Annals of Glaciology publishes original scientific articles and letters in selected aspects of glaciology-the study of ice. Each issue of the Annals is thematic, focussing on a specific subject. The Council of the International Glaciological Society welcomes proposals for thematic issues from the glaciological community. Once a theme is approved, the Council appoints an Associate Chief Editor and a team of Scientific Editors to handle the submission, peer review and publication of papers. Typically from one to three issues of the Annals appear each year. Since the publication of issue 1 (Use of Icebergs) in 1980 and issue 2 (Glacier Erosion and Sedimentation) in 1981, every branch of glaciology has featured in at least one issue of the Annals. Recent themes have included Glaciers and Ice Sheets in a Warming Climate; Ice Core Drilling Technology; Sea Ice in a Changing Environment; Contribution of Glaciers and Ice Sheets to Sea Level Change; and Glaciology in High Mountain Asia. Tweets by Int. Glaciol. Soc.